It sometimes can take years for a company to complete a core series of characters, and in some cases companies just give up! The Lord of the Rings is one such movie series, where the cast of characters is so extensive even large companies like Sideshow give up on it. 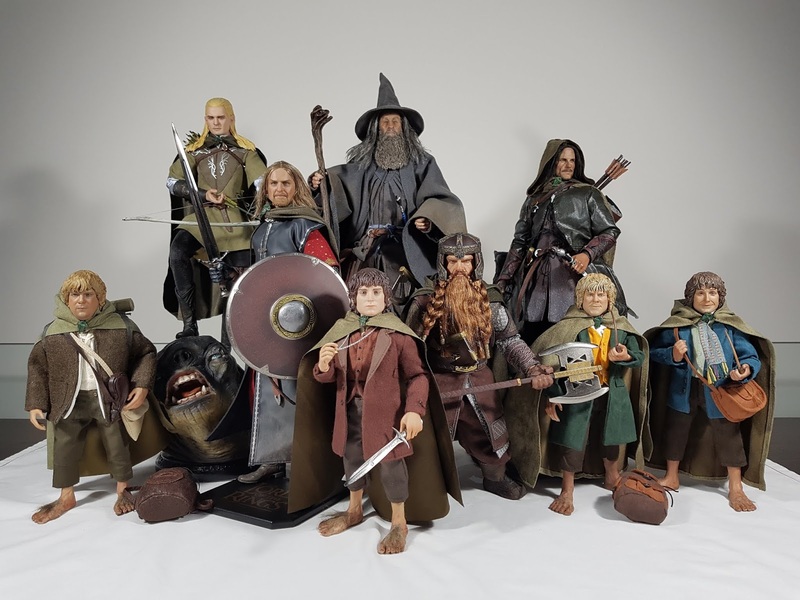 So when Asmus started producing official Lord of the Rings figures, there was doubt they would be able to complete the core Fellowship cast. But they promised they would, and they have delivered on that promise in the best possible way! 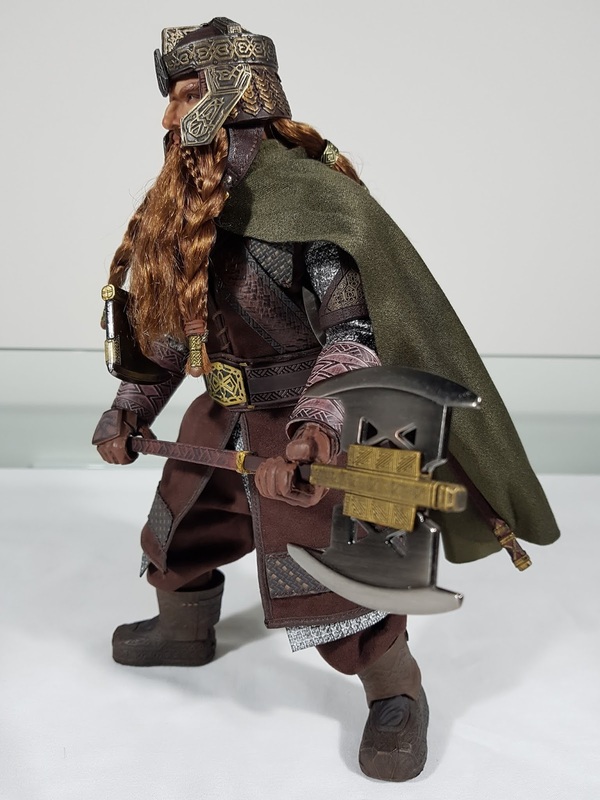 This Gimli is a fantastic figure, and shows just how far Asmus has come from their first figure to this new Gimli. Click through below to watch my 2-part review of the figure that is definitely one of their very best figures to date. Part 1, covering the main figure and accessories. 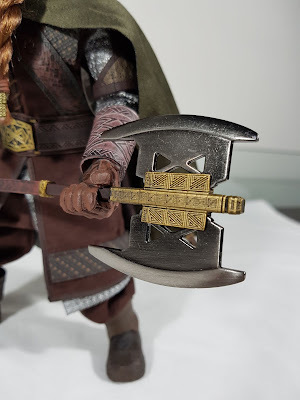 Part 2, covering the final setup of the figure and the complete Fellowship cast of figures. The packaging is the same style as their previous releases, with decent cover art and clamshell. As always, the figure comes with a decent array of accessories of exceptional quality. The 5 axes are all made of diecast metal, with intricate detailing that shows the likes of Hot Toys how weapons really should be done in this scale! 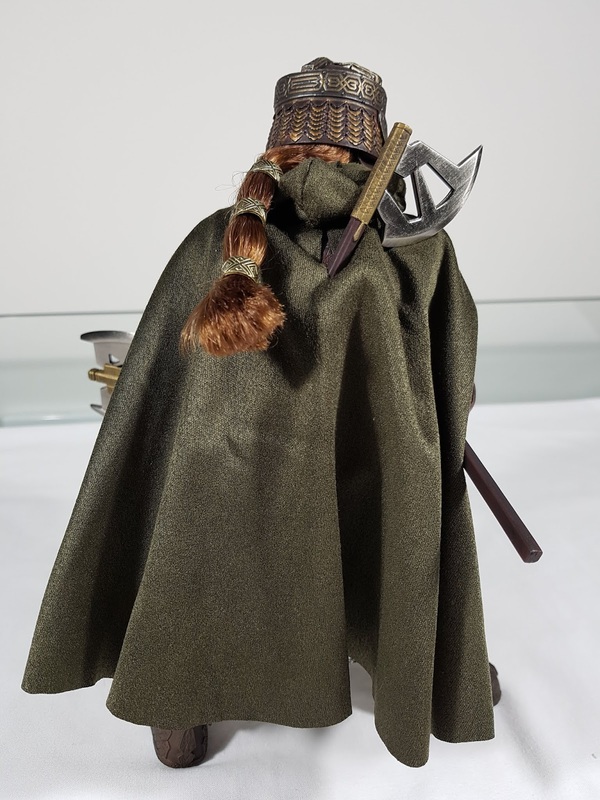 The elven cloak is the same nice soft material as previous released with the other figures, this time with an improved brooch. It's a shame the brooch is pretty much hidden by the beard once put onto the figure! The array of hands are nicely sculpted and painted, but definitely need some hot water to soften them to hold the weapons. The helmet is also nicely done, with a strap that goes under the chin of the head sculpt. It was a little tricky at first to get it on, but I realised it had to be put on at an angle. This way the knotches inside the helmet fit over the ears of the figure nicely and the centre sits just above the bridge of his nose. It's nicely done, but just be careful taking it off as it may catch the rooted hair. Once all set up, the figure simply looks amazing. Asmus spent a lot of time prototyping the rooted hair, in particular the beard and moustache. They took collectors on that journey with many behind the scenes photos of their trials. The end result is spectacular, and shows that they now have the skills to manufacture in large scales the intricate details of braided hair. 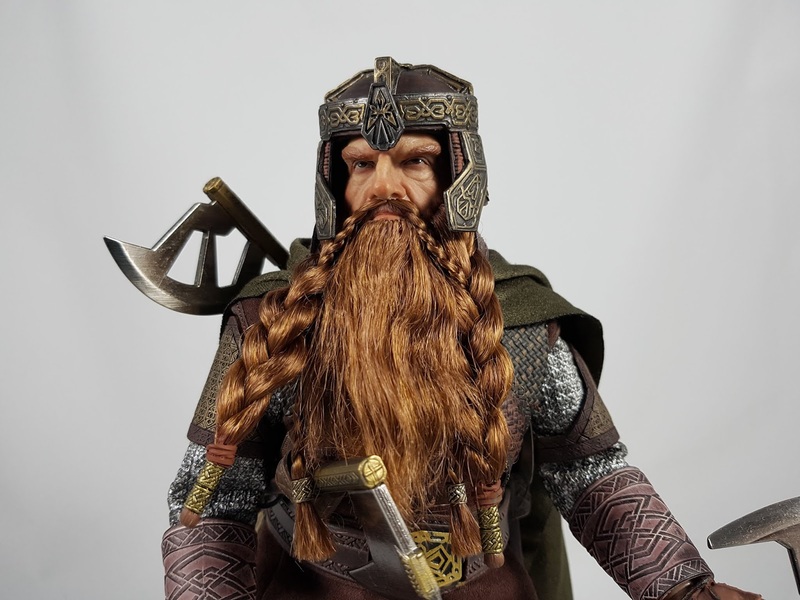 The thicker braids along the outer beard, and the finer braids for the moustache are done beautifully and realistically. It all melds together with the face sculpt perfectly, with little sculpted and painted areas on the skin that blend it all. The facial paint app is also an improvement over previous figures, with nice skin texture and realism. There probably isn't as much wrinkling and details as the prototype, but that's probably expected going into final production. Overall, this is the best work they've done in the series so far I think. You can display the figure without the helmet, but I think the classic look is definitely with it on. It fits nicely and frames the head sculpt perfectly. Some have had issues with the head sculpt sitting a little too high, but I put some hot water on the joint, and it pushed down nicely for me. As I mentioned, the axes are beautifully done. The brushed metal gives a realistic weather appearance, and the minute details really show the skill they have in the manufacturing process for these. It puts to shame weapons like the Hot Toys Wonder Woman sword that was made out of plastic. All the weapons have slots on the costume to hold. The only issue is trying to fit the two smaller axes onto the left side of the belt. The holes for them are very small, and it will take some careful adjustment to get both in. My belt looked like it was starting to split when I tried to put both, so I stopped and left only one in there. I have seen photos with both axes in, so it is possible, but just be very careful. But for the most part, the weapons go in easily enough. The medium sized axes fits on his right side nicely through the loops on the belt and his torso strap. 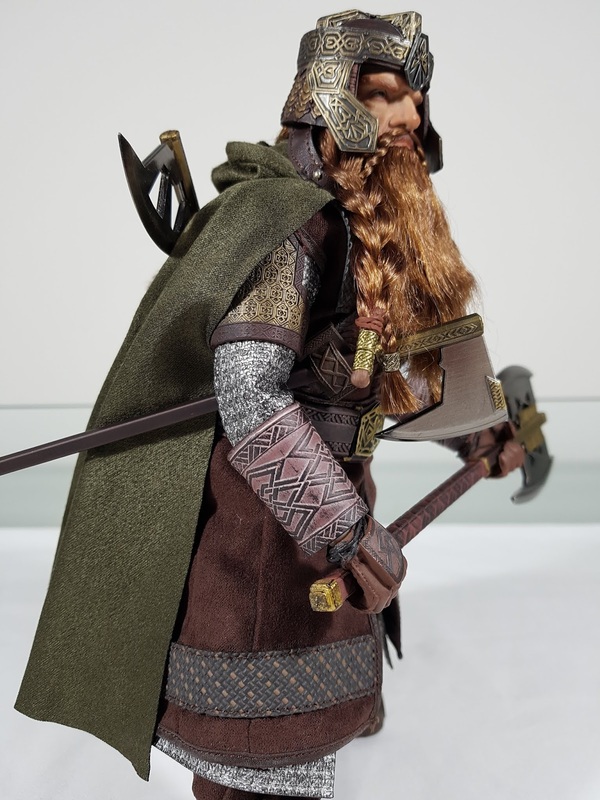 The larger axe fits through loops on his back and through the hole in the elven cloak. Just adjust it to balance where the axe lies so that it doesn't slip down. The rest of the costume is right up there with the best from Asmus. They have always excelled at clothing, and Gimli is no exception. There are multiple complex layers, so just futz around until you get things laying naturally. My only concern would be the material they've chosen for the chainmail. It's a silver type patterning on the front, with some sort of semi-rigid rubber backing. I think that over time that might start to crack, so it's probably best to avoid too much bending at the elbows. 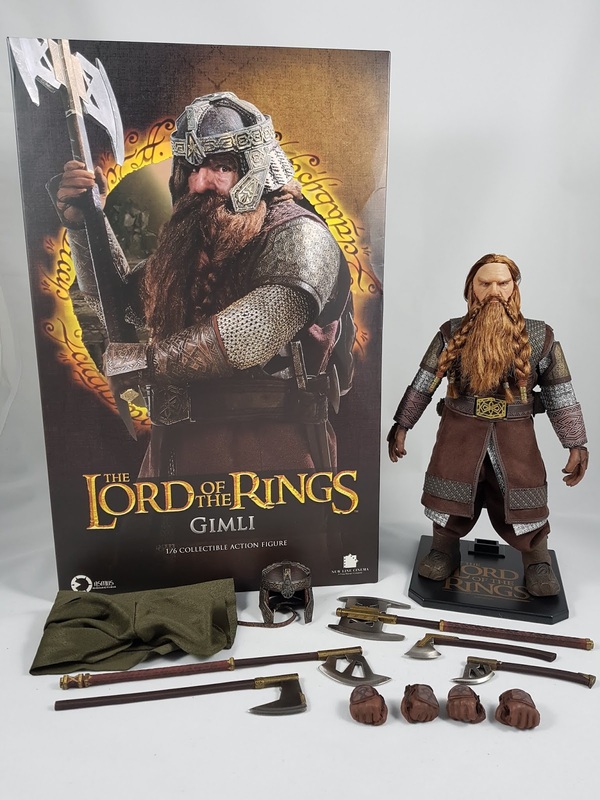 Overall, Asmus has now completed the core Fellowship of the Ring with an outstanding release in Gimli. They are the only company I know of that have been committed enough to do all 9 characters from the Fellowship. The consistent quality makes them all look fantastic displayed together. With their rooted hair technique now perfected, I really hope they go back and release an expansion set for Legolas with rooted hair. 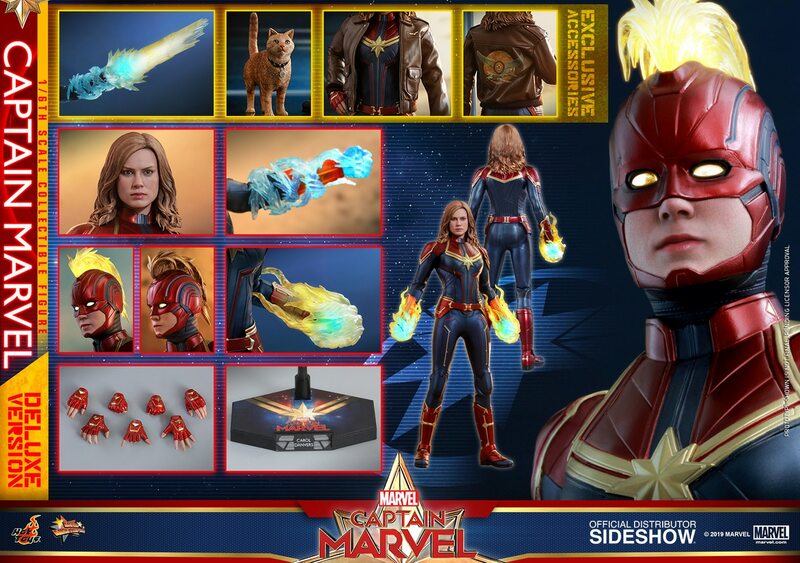 That would definitely take that figure to the next level and top off a set of amazing figures. 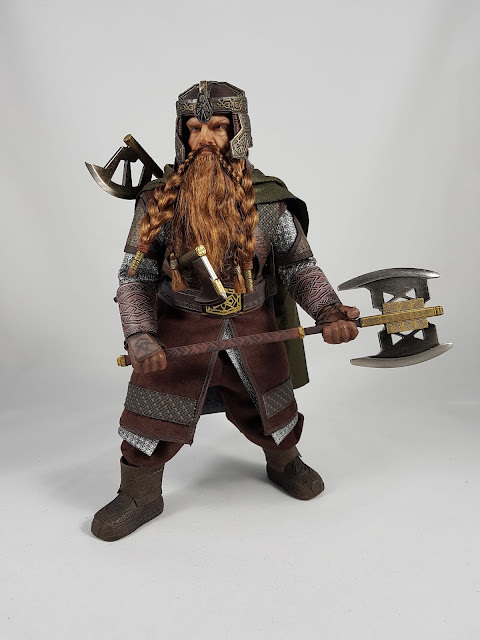 I'm glad Asmus has come through on their promise, and these figures will be a centerpiece of my collection for many years to come!